The all-new U.S. Master Tax Guide® (2018) Special Edition — Tax Cuts and Jobs Act has been updated exclusively to provide complete and reliable guidance on the historic Tax Cuts and Jobs Act — the most sweeping change to the U.S. tax code in decades. Virtually all taxpayers are impacted by this bill, with individual taxpayers, corporations, small businesses and pass-through entities witnessing the most significant changes. By preparing now, you can gain complete understanding and knowledge of the major provisions and ensure the most proficient tax services are provided to your clients. 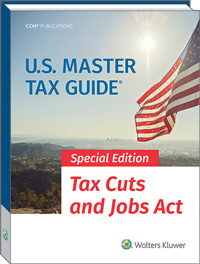 U.S. Master Tax Guide® (2018) Special Edition - Tax Cuts and Jobs Act is also available in an eBook format which you can download to your computer instantly.